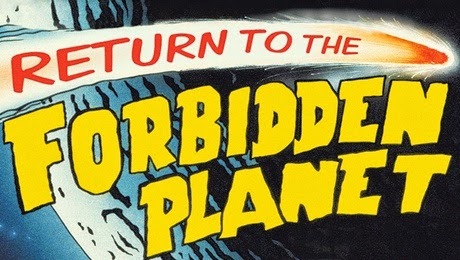 25 years after Captain Tempest and his crew first journeyed into hyperspace, and 14 years after the last UK tour, Olivier Award-winning rock spectacular Return to the Forbidden Planet is back and exploding onto stage in a major new 25th Anniversary production, playing at the King’s Theatre from Monday 9 February for one week only. Inspired by Shakespeare’s The Tempest and packed with rock n’ roll classics including Great Balls of Fire, This is a Man’s World,Don’t Let Me Be Misunderstood, Who’s Sorry Now, Teenager in Love, Young Girl, Heard It Through the Grapevine, Johnny B. Goode and Born To Be Wild, Return to the Forbidden Planet is a musical of meteoric proportions that will be remembered for light years to come. With stunning special effects, a brilliant cast of actor-musicians, a mad scientist, a huge green-tentacled monster and a rock ’n’ roller-skating robot, your in-flight entertainment is guaranteed! So fasten your seatbelts, set your ray guns to stun and prepare for blast off! Founding member of Queen and world-renowned guitarist Brian May will appear via video projection as the Newscaster. In addition to May, The cast features Steve Simmonds as Bosun, Sean Needham as Captain Tempest, Christine Holman as Science Officer, Greg Last as Navigation Officer, Mark Newnham as Cookie, Jonathan Markwood as Prospero, Frido Ruth as Ariel, Sarah Scowen as Miranda, Georgina Field as Anne Droid, Callum Hughes as Phil McCavity, Joseph Mann as Ewan Watami and Hannah Howcroft as Young Miranda.